There are words and phrases that irritate me when I hear them in speech. Words like ah, uhm, eh, you know, so, whatever, fine – I could go on. But the one that has me ready to wretch is “basically”. When I listen to an interview, I often hear the interviewee start a response with, “well basically”. Don’t get me wrong, I do catch myself saying it as well. But it seems to have reached epidemic proportions in media interviews and in general conversation. What the interviewees and speakers are doing is buying time for themselves to formulate an answer – at least that’s my guess because what follows that introduction is rarely a distillation of the facts or the essence of an issue! 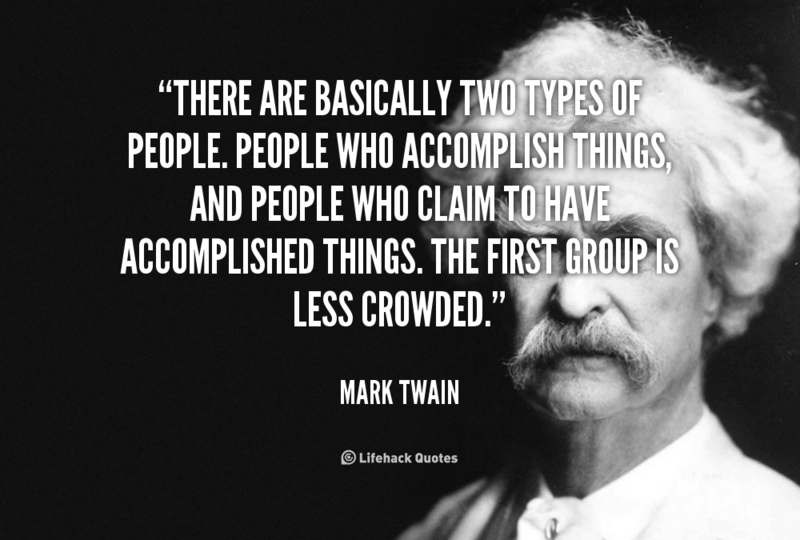 Even this quote from Mark Twain who for the most part was stingy when it came to using superfluous words, could have ditched the “basically” and moved right to “two types”. One of the bosses for whom I wrote challenged me to eliminate adverbs from my writing. When you do that you choose verbs that capture your meaning. By the way, it also takes your vocabulary past the “basics”. My challenge (and yours if you accept it) is to catch yourself when you say “basically”. Become aware of when and how you use it. I am confident you will find it is a filler and has little or nothing to do with what follows. Basically, this rant is now over and I will get on with more pressing issues! I want to be part of the first group.